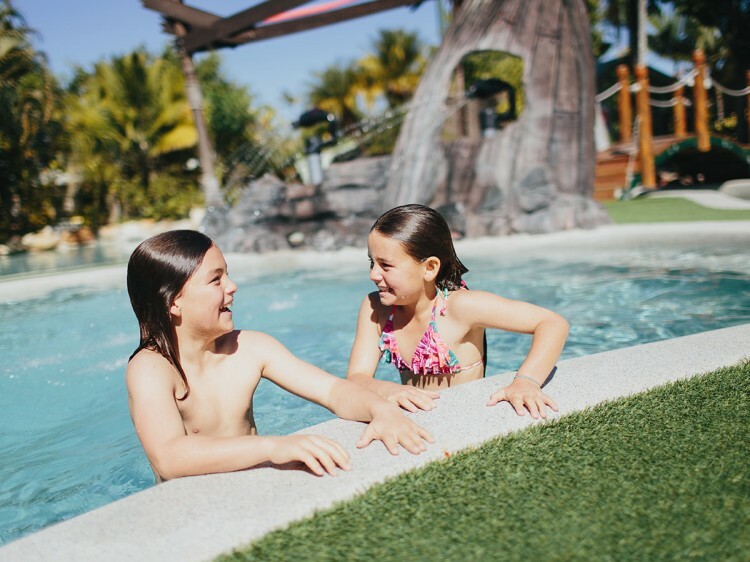 Enjoy the ultimate family holiday on QLD’s fabulous Gold Coast with a stay at NRMA Treasure Island Holiday Resort. This award winning holiday park is only a 15 minute drive north of Surfers Paradise, centrally located between all major theme parks and a short walk to fantastic outlet shopping at Harbour Town. 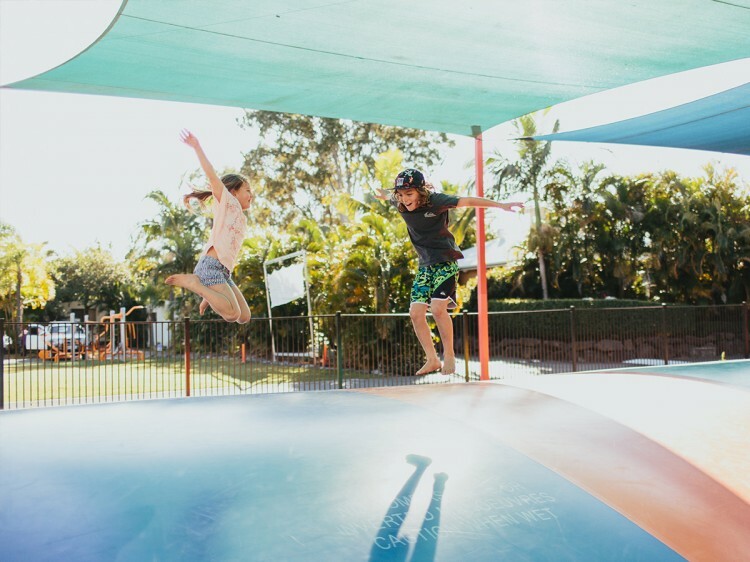 Whether you’re after a relaxing family break or an action packed adventure holiday, NRMA Treasure Island Holiday Resort is the perfect place for you. 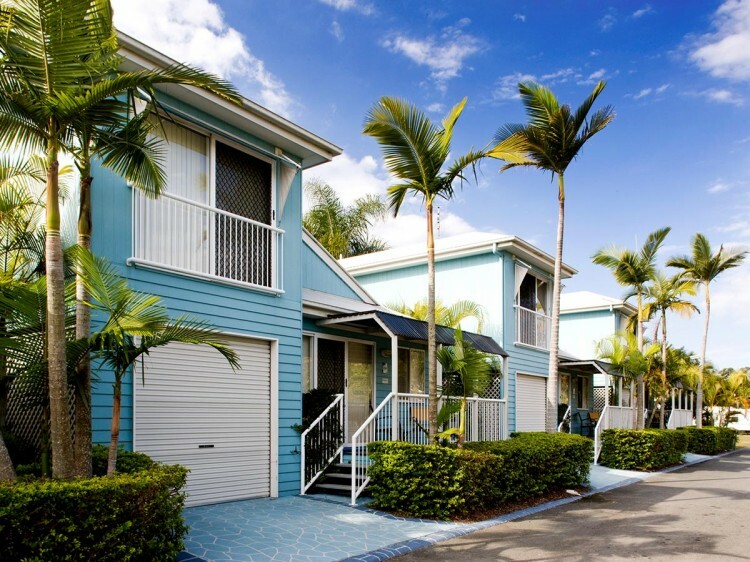 There is a great range of self-contained accommodation to choose from at NRMA Treasure Island Holiday Resort. From 1 and 2 bedroom units, cabins and villas to 3 bedroom two storey townhouses can cater for all needs and budgets. There is a sensational array of activities and facilities for the whole family to enjoy. Make a splash in one of the three resort pools, have a game of tennis, challenge the family to mini golf, or enjoy a meal and refreshing drink at Galleons Bistro & Bar. Kids will love the giant jumping pillow, go karts, playground and Kidz Korner activities program which runs 364 days a year. Offering sensational al fresco dining where you can enjoy a tropical breakfast, lazy lunch, scrumptious evening meal or even a quick afternoon snack. The Bistro is open 7 days a week for breakfast, lunch and dinner (closed for dinner Sunday and Monday nights during off season). The Kidz Korner Activity Program is full of fun activities which can include: soap making, plaster painting, chocolate making, sand art, treasure and scavenger Hunts, colouring in competitions with prizes to be won, indoor games day and much much more. Activities are not a child minding facility so remember to bring Mum or Dad along as they are designed for fun and to bring out the fun-spirit in everyone! Please note: Fees and charges may apply for the use of some activities and facilities. Overlooking the Riverside Pool and Biggera Creek, this three bedroom villa with garden views sleeps eight. It features 2 queen beds + 2 sets of bunk beds. Fully equipped kitchen including dishwasher, oven, stovetop, microwave and fridge; air-conditioning; two bathrooms; veranda and balcony; dining setting and lounge with flat screen television, DVD and Foxtel; garage for one vehicle. Surrounding the Lagoon Pool and Spa, this three bedroom villa with garden views sleeps nine. It features a queen bed and television in the main bedroom, queen bed in the second bedroom, two single bunk beds in the third bedroom and a fold-out sofa bed in the lounge. Fully equipped kitchen including dishwasher, oven, stovetop, microwave and fridge; air-conditioning; two bathrooms; veranda and balcony; barbecue; dining setting and lounge with flat screen television, DVD and Foxtel; garage for one vehicle. Nestled around the Lagoon Pool and Spa, this two bedroom villa sleeps six. Main bedroom has one queen bed and television and second bedroom has two single bunk beds. Fully equipped kitchen including dishwasher, oven, stovetop, microwave and fridge; air-conditioning; one and a half bathrooms; veranda with deck chairs; barbecue; lounge and dining area with flat screen television, DVD and Foxtel; garage for one vehicle. Situated close to the main pool and spas, playground and barbecues, this two bedroom villa sleeps up to six in one queen bed and two sets of single bunk beds. It features air-conditioning, kitchen, one bathroom, verandah, dining and lounge area with DVD. Situated by the main pool this two bedroom villa sleeps up to six in one queen bed and two sets of single bunk beds. It features air-conditioning, kitchen, one bathroom, verandah, dining and lounge area with DVD. The spa studio unit offers garden views and sleeps two adults and two small children, with one queen bed and one fold-out sofa. Kitchenette including microwave, fridge, toaster and kettle; air-conditioning; one bathroom; small veranda/patio with two seater setting; lounge area with flat screen television and Foxtel; parking for one vehicle. Open plan studio cabin centrally located in the park sleeping up to two in one double bed. Kitchenette including microwave, fridge, toaster and kettle; air-conditioning; one bathroom; small veranda/patio; dining area.